On the road again … “Just can’t wait to get out on the road again, Goin’ places that I’ve never been, Seein” things that I may never see again, And I can’t wait to get on the road again.” Thanks, Willie Nelson, your words capture the anticipation of this forthcoming, last adventure. Whoa, what’s that “last adventure” stuff all about? Well, yeah, probably. These three-week motorcycling trips always include camping, sleeping under the stars, spending evenings by a campfire after eating my freeze-dried dinners, and writing my day’s journal. Gad, I love it! Meeting fellow campers, snuggling in a sleeping bag in the crisp night air, and drinking morning coffee as the sun peaks over the horizon. It just doesn’t get any better than that! But you know what? Erecting a tent, crawling around on the ground on hands and knees, and bending over my Jetboil camp stove, is just not as easy for an 80-year-old as it used to be. Stay in a motel, my sympathetic wife advises. Naw, it’s not the same. That’s not an adventure. So, here’s a new awareness to contemplate. Death! Wow, shocking word. At some point, you realize the newspaper’s obituary includes folks much younger than yourself. There’s a good chance you may never buy another new car. You’re never going to make that exotic trip you always talked about. Never going to write that next book floating around in your imagination. So here I am teetering on the edge of that awareness. I’m healthy. Exercise regularly. Still buy green bananas. And I know several 80+ friends doing just fine. I’m convinced I have at least one more trip in me … I think. I’ve been on eight of these extended multi-week motorcycle adventures. Rode thru the southeast one time spending a week in a hang-gliding school and visiting Civil War battlefields. Went east taking the ferry to Nova Scotia. Went north into Canada visiting Montreal and Quebec. And traveled west to Yellowstone, Glacier and the state of Colorado several times. I travel alone. What, isn’t that dangerous? Well, maybe, but I’ve got my cell phone, I tell my wife. You see, my purpose for being out there is the see the sights, meet the people, and learn their stories. I’m a frustrated writer looking for stories to tell. That’s what I do at my campground every night, share the stories with 200 VIPs (virtual Invisible Passengers) via email and blog (jimstarknavy.com/jimstark/blog). Yep, 200 family and friends who seem to enjoy my communications. So, my challenge every day is to discover interesting stories to tell my virtual fellow travelers. The promise I make myself is this, if I fly by something eye-catching at 70 mph, I’m to stop, turn around, and check it out. You can’t do that if you’re riding with a companion or group of riders. So, I’m hitting the road again. The destination this time is Utah and its National Parks. I’ve been to Arches Nation Park once before, but there are four others. I plan to camp in three of them for two nights each. En route, I always try to find at least one tourist attraction to visit to break up the day’s travels. ← My friend, William F. Buckley, Jr.
Where are you folks these days? Probably won’t do FL this year. More on that later. A big salute to a REAL American hero, John McCain. Still remain my hero. Be safe. Once you get home will you have any news about your plans for the winter? Jim, you have been, and continue to be, an inspiration to this younger adventurer. Here’s hoping your exploration produces many eye-catching discoveries. Safe travels. JUST LIKE THE EXPLORERS WHO DISCOVERED North America. KEEP GOING JIM. Can’t wait to read about your adventures, Dad! Thanks so much for taking us along!! Nancy and Mimi. What a super fan club. Canyonlands are awesome-so jealous of your travels! Hi – reminds me of my 2-week motorcycle trip from Ft. Huachuca, AZ, back home to IN in 1969 – camped, cooked freeze-dried meals – same kind of things. Could do it now at 73, I think, but may have to wait ’til I retire. Maybe we’ll pass each other on the highway. I’ll be the one on two wheels hidden under stacks of camping gear. Safe travels Jim. Can hardly wait to read your posts. I’ll be near Casper Wyoming for a week on a cattle drive starting this Saturday. Like you say, there is something about flopping a sleeping bag on the ground and starring up into a world where we have but flown only around the edges. Rather sure every one of us VIP’ers are excited for yet another Goldwinger journey. As a fellow solo traveler on wheels (without a motor though) I am so looking forward to Utah. It has always sounded so majestic to me, and I predict that your adventure will kick this Canadian into action. You can do it. My youngest son “ran” the Appalachian with nothing but a funny pack. So enjoyed it, it kept going and ran across the U.S.
Where does he get such crazy ideas? Good Luck Jim, I’ve still got a dream to thru hike the Appalachian Trail – you sound just adventurous enough to join me as a trail partner. 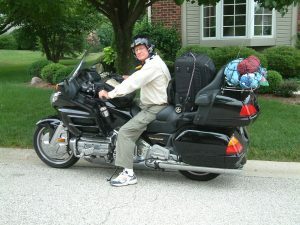 Through my research, I’ve learned that less than 1% of 70 year olds make the entire 2,200 mile trek once they’ve started. Mostly due to injuries, exhaustion, running out of time, etc. I guess one way to avoid being one of the 99% who don’t make it is to never begin ! ! ! Safe travels, Jim. Looking forward to reading your daily entries.